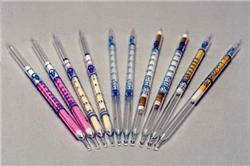 Gastec 273 Chromium (VI) Ion (Solution Tube) Detector Tubes. Detection Range: (0.5)-50 mg/l. 10 measuring tubes per box.